After last year’s attempt at a lattice crust (not so fun), I decided to try a crumble top this year. And I am so glad I did. This was the best apple pie I’ve ever had! 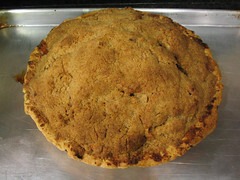 The Granny Smith’s give it a nice tartness, and the crumble top has the perfect amount of sweetness. It’s safe to say I’ll be using this recipe again and again and again. Notes: I added a few Fuji apples for a little sweetness. Also, I have one of the most amazing inventions ever, that made preparing the apples the easiest thing ever. If you don’t have one, you must get one. Recipe from Bon Appétit via Epicurious. That DOES look like the best ever ever! Crumb-topped apple pie is the only way to go! Can you use margarine to keep it parve? Lattice pie crust is easy once you get the hang of it. I have my aunt audrey’s pie crust recipe and it’s super easy. I also like Julia Child’s pie crust and the key to the crust is to keep the butter in small pea like chunks and make sure to not only knead it until it forms a ball then put it into a flattened round circle and cover it and refrigerate it for several hours. I have a tutorial at my blog site in the cooking section of my pictures.